South and North Korea are holding a second round of talks to discuss plans to modernize and connect railways over the inter-Korean border. The Unification Ministry said Thursday that a six-member South Korean delegation led by Hwang Sung-gyu, a senior transportation ministry official, is meeting with North Korean officials for talks at the inter-Korean transit office on the western border. North Korea has also sent a six-member delegation. 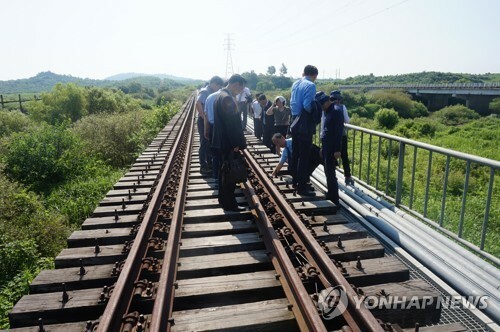 The two sides are expected to discuss schedules and detailed plans for joint on-site inspections of the sections of the railway along the North's eastern and western regions. The joint inspections are set to begin late this month. The two Koreas conducted joint inspections last month on the sections and held a related meeting in the North Korean border city Gaeseong.